The KontrolFreeks the company sent us for testing. From left are the Havoc, the Phantom and the SpeedFreek. Click on the image to see our review. KontrolFreeks are doodads that attach to the tops of game-controller joysticks, for the purpose of increasing speed, control and comfort. We were doubtful, but tried 'em and liked 'em. Read all about it. 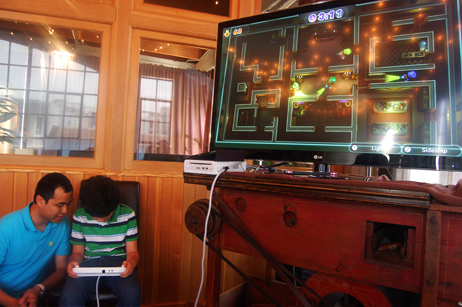 With the help of Nintendo developer J.C. Rodrigo, Riley uses the Wii U controller to play a new variation of Luigi's Mansion that is still in development. Very fun game. Riley and Maria and I got a chance to play with developmental versions of the Wii U console on Monday, and gee, did we have fun. It is a very cool device! Ya got one player on the new handheld -- which has its own built-in screen -- and ya got four others on Wii remotes. The player with the new handheld has supreme power. It's major fun. Read more about the Wii U.